In a holiday caravan park on the Swedish island of Gotland a man is shot while jogging early one morning and police are, at first, baffled by the crime. The man owned a successful construction business, had a loving wife and family and seemed a most unlikely candidate for such a grim murder. Both police and the local journalists working on the story have to wade through lots of interviews with the man’s family and associates before any hint of a motive emerges. In fact it’s not until there is a second murder some way into the book that a genuine suspect becomes evident. While I would like to start every series at the beginning and read them in order, I simply do not have enough hours in my life so I was pleased to see that this book, though fifth of a series, was recommended at Euro Crime as a good entry-point to that series. As always Euro Crime steered me in the right direction as I did not find myself at a disadvantage despite having read none of the earlier books. At the start of this one the investigative team is being led by Karin Jacobssen while her boss, Anders Knutas is on holidays. She is looking forward to heading up her first investigation on her own though nervous enough to ring Knutas and let him know about the murder. This backfires on her as he soon returns from holidays, unable to let the investigation take place without him. This is the source of a well-depicted thread in which Jacobssen worries that Knutas believes her incapable of doing the job and him having to explain his reasons for stepping back in so quickly. We spend quite a bit of time following this and other personal issues of the various police officers as well as the journalist who is working on the story. Knutas is suffering something of a lull in his marriage and there are some unexpectedly awkward moments between himself and Jacobssen, though these do not resolve as you might expect (a point in the book’s favour). The journalist, who has clearly been involved in early stories, is also experiencing some personal problems as the mother of his daughter has become very distant and this thread provides another point of interest. Even Karin Jacobssen’s own personal history becomes important towards the very end of the story and, like all the other significant characters, she is nicely and believably drawn. I did thoroughly enjoy this expertly translated and delightfully narrated audio book with thanks to Tiina Nunnally and Simon Shepherd respectively. I am becoming quite enamoured of having translated books read to me as the correct pronunciation of the names of people and places seems to add something to the authentic feel. I will definitely be eager to read the next book of this quietly absorbing series and may even be tempted to go back and read some of the earlier ones (well at least the one I have sitting on my TBR shelves). 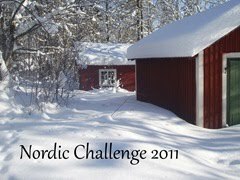 This entry was posted in book review, Mari Jungstedt, Nordic Challenge 2011, Sweden. Bookmark the permalink. 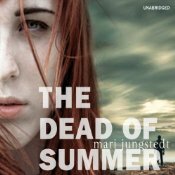 I like Mari Jungstedt’s books but I seem to have lost track of where I am in the series. I’ve not read this one – will keep an eye out for it. Thanks for the review – I’m a big fan of audio books but here in the UK people can be really sniffy about them. No idea why as I do a lot of driving and the time passes in a flash if I’m listening to something good rather than drivel on the radio. Oh people can be sniffy about audio books here too Sarah but I’ve decided I don’t care (in fact I did a bit of research in our work library and it seems there’s no discernible difference in comprehension or information retention to differentiate between the two forms of ‘reading). I try to walk to work each day (about an hour) and if I didn’t have the promise of an audio book to keep me company I simply would not exercise at all as it would be too dull – but when I have the promise of someone telling me an interesting story I’m usually ready to leap out of bed (well at least get out with some enthusiasm). Bernadette – Thanks for, as ever, a top-notch review. So nice, isn’t it, when you can start a series somewhere other than the beginning and enjoy it without feeling cheated… Where I live, almost everyone has quite a commute to work. It’s an auto-hungry place. So audio books are such a wonderful thing. And I agree completely that listening to a translated work can give an authentic feel to the story because the narrator pronounces the names as the author intended them. Hi Benadette, I found this really helpful and have a soft spot for audio books, which i listen to on my ipod. I agree with Sarah, when she says some people are sniffy in the UK about them, like books with large lettering. It’s as if listening to an audiobook suggests you’re somehow aged or developed a disability, which shouldn’t be an issue anyway? I digress. A great review as always. And a new crime author to ad to my list.Thanks. Yep I too enjoy audiobooks but must say I have not looked in to the download process. Don’t presently have an iPod. Is there other forms you can download to for listening in your car? Eg: USB? or does this clash with the format? Any suggestions are welcomed with open arms. I am about to embark on a long plane trip to the other side of the world, so a nice audiobook would be great company. And I have enjoyed 1 other of Mari Jungstedt’s title. Loved the setting so I am hungry for more! The only place I’ve ever downloaded from is Audible which has sites in both the US and UK (here in Australia we can only use the US one, I guess all countries will direct you to one or the other). You can download books in many formats and for many devices – for all versions of iPod and other mP3 players as well as phones, GPS systems etc, most eReaders too – basically anything with a speaker or a headphone jack. You can download in a format suitable for CD burning so I assume you can also download for a flash drive too. Their device centre page lists all the brands and types of devices they support http://www.audible.com/dc One of the things I like about audible is that once you’ve bought a book it’s in your library and you can re-download it if you change devices or decide you want to listen on your phone instead of your iPod that’s fine.